Approximately 3% of newborn babies suffer from congenital anomalies (birth defects), which is a serious burden for patients and their families. Many congenital anomalies are assumed to be caused by the interaction of gene mutations and environmental factors, but the etiology and pathogenetic mechanisms remain to be clarified for most birth defects. In our laboratory, interdisciplinary research approaches are being undertaken to elucidate the causes and pathogenesis of birth defects and to attempt to identify some preventive measures. This Center has the largest collection of human embryo specimens in the world comprising of over 44,000 therapeutic abortuses. Most of the specimens are between the 3rd and 8th week following fertilization, which is the critical period of teratogenesis. In the Kyoto Collection of Human Embryos, an appreciable number of malformed embryos are included, which provide a unique opportunity to study the early stages of abnormal morphogenesis. A variety of research projects are at present being undertaken on the embryo collection. 2.Sakai T, Hirata S, Fuwa K, Sugama K, Kusunoki K, Makishima H, Eguchi T, Yamada S, Ogihara N, Takeshita H. Fetal brain development in chimpazees versus humans. Current Biology 2012, 22(18): R791-92. 3.Kameda T, Yamada S, Uwabe C, Suganuma N. Digitization of clinical and epidemiological data from the Kyoto Collection of Human Embryos: maternal risk factors and embryonic malformations. CongenitAnom Kyoto, 2012 Mar;52(1):48-54. 4.Yamada S, Lee ES, Samtani RR, Lockett E, Uwabe C, Shiota K, Anderson SA, Lo CW. 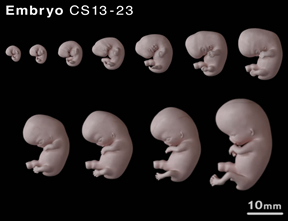 Developmental atlas of the early first trimester human embryo. DevDyn, 2010 Jun;239(6):1585-95. 5.Dhanantwari P, Lee E, Krishnan A, Samtani R, Yamada S, Anderson S, Lockett E, Donofrio M, Shiota K, Leatherbury L, Lo CW. Human cardiac development in the first trimester: a high-resolution magnetic resonance imaging and episcopic fluorescence image capture atlas. Circulation. 2009 Jul 28;120(4):343-51.